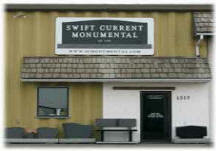 Since 1969, locally owned and operated in Swift Current, Saskatchewan, Canada by trained, experienced personnel. We provide the highest quality granite monuments at a competitive price. Also offered are bronze-lawn level markers, vases, porcelain photos, benches, columbariums, plaques and signs in either granite or bronze. We guarantee our work and will help you chose a monument that's right for you and your loved ones without pressure. Sorry, we do not handle granite countertops.